Storage is an integral part of every basement finishing project that we work on. 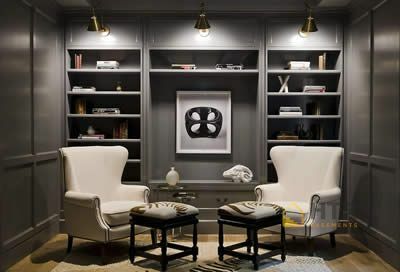 Built-in shelving is a great solution to store and display media, books, art, photographs, toys, and anything else you want to have close by but out of sight when you’re using your basement. Your choice of materials for your built-in shelves is a question of available space, choice of style, and, of course, budget. Custom, solid wood built-in shelves offer the most luxurious finish and are the sturdiest option. If you want a solid wood shelf, then our designers and carpenters will work closely with you to design a unit that fits your needs exactly. You have a variety of choices for the type of wood, stain, and paint. A custom solid wood shelving unit requires the most investment as it requires real wood materials and carpenter labor, but it also can be the most rewarding in terms of style and elegance. A custom built-in unit can range from $1,000 to $15,000 depending on the design and choice of wood. Drywall is a versatile material for a shelving option as it will flow with the rest of your basement space. Drywall shelving can be symmetric around a TV wall or as a standalone unit. You can add spot lights inside the shelves to accentuate the area, and you can paint it in your favorite color to match the rest of your basement’s design. MDF or Medium-density fiberboard is the most popular and affordable choice of material for built-in shelving. MDF comes already finished and in standard sizes, making it more affordable than customized wood shelves. You can add drawers and doors to the unit, making it a flexible and customizable option for a lot of homeowners.